Someone asked me the other day how I planned the canoe trips I've go on. They remarked that it seemed like I got myself pretty far off the beaten path and just where did the ideas come from. I use several different resources when planning a trip some are online such as the Canadian Canoe Routes website, http://myccr.com/, peruse the routes section or the forums for a wealth of information and the Ottertooth site, http://ottertooth.com, which has some excellent interactive maps for the Temagami Canoe area.There are route guides such as the Kevin Callan books or my favourite the Hap Wilson Temagami guide, mostly because I spend much of my time canoeing in the Temagami area. 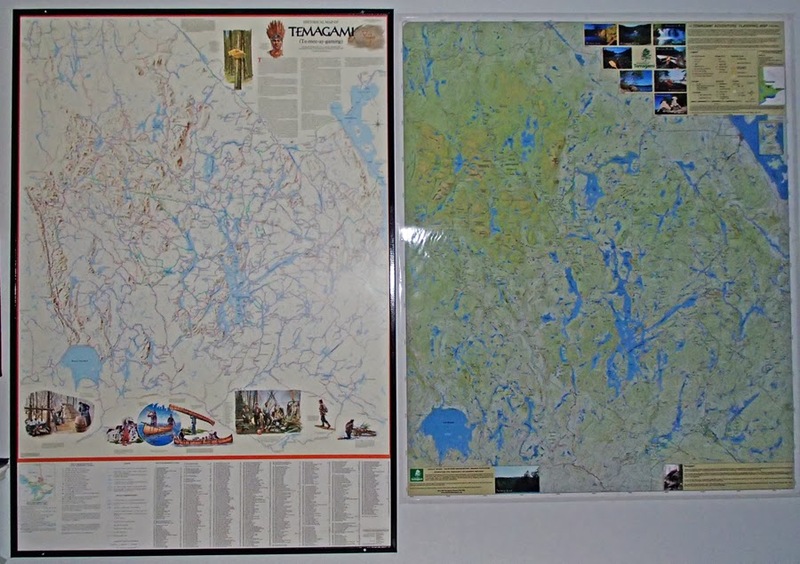 However my favourite is to use the 2 large Temagami area maps I have. They are both a detailed depiction of the routes in the Temagami area. One is the Craig Macdonald map that shows Temagami as it was in 1900. Craig Macdonald is an ethno-geographer, Cree-Ojibwa place-name linguist and trails expert who spent 27 years doing research in the area. He interviewed over 200 Anishinabai elders and traveled over 1,000 miles in the backcountry exploring the nastawgan and methods of travel on them. Craig estimates that the nastawgan have been in use for over a thousand years. Temagami Nastawgan Map. 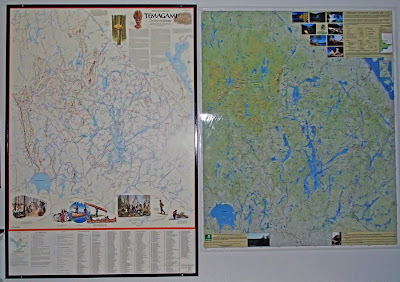 The other is the Friends of Temagami Adventure Planning map. For the past two decades, the Friends of Temagami has been documenting, restoring and promoting lost, forgotten and underused canoe routes in Temagami. This map is the result of a comprehensive review of existing information coupled with on-the-ground explorations. Temagami Planning Map. It's neat to trace routes out on the Nastawgan map and then the Adventure Planning Map, you quickly realize that the routes have been in constant use for a long time. I have used the nastawgan map to go looking for older routes that have fallen into disuse over the years such as the Marjorie Lake route which has been remapped and the portages re-established, putting the route back into use. Marjorie Lake Route. I have the maps mounted on a wall and it's the first resource I turn to when I get the itch to get out canoeing again. I use it for the general layout of the route etc and then start researching the other resources mentioned for further information. Anyway, it's getting close to winter these days andI've now turned to winter camping trip planning - more maps! Welcome to canoedog.ca. This personal site is a way for me to keep a record of some of my canoeing, kayaking and winter camping adventures and as a vehicle to share them and information to other interested folks. This site has been compiled from my personal experiences over the years and is based on my own personal style of engaging in differing outdoor activities. I do not accept any responsibility and/or liability for any events that result in injury, death, losses or damages from any use or misuse of, misinterpretation of or any errors in any information found within this website. This information is based on personal experience and doesn't suggest or imply that all information is universally accurate and any information used in whole or in part is done at your own risk. Enough said, it's a big world out there, so get out and enjoy it! ..